Truckers don't take a deal with the government and keep on strike. It takes a general strike! The truckers did not accept the government's deception and, contrary to most of their directions, kept the national strike coming to its fifth day this Friday, 25. There are outages in 24 states and in the DF, with over 500 blocking points. On Thursday night, the government announced an agreement with the directions of trade unions and entities in the category in which it undertakes to reduce Cide on diesel and to guarantee 10% discount on fuel for 30 days. The day before, the president of Petrobras, Pedro Kin, had proposed the discount in exchange for a truce for 15 days. Still on Thursday, there was already a signal that case's attempt to stop the movement would fail. 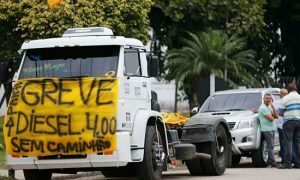 Representative of ABCAM (Brazilian Association of Truckers), one of the entities present at the negotiating table, abandoned the meeting and said the strike would continue. Even so, the government and most of the entities ' directions maintained the agreement and announced to the press the end of the shutdown. By the Government's proposal, in addition to reducing the tax on diesel, there would be subsidies to Petrobras to guarantee the discount. In other words, the company's price increase policy would continue and more public money would guarantee the profits of Petrobras ' foreign shareholders.